Last Friday, I was lost in the endless to-dos of production for an upcoming photo shoot. I’ve been there many times before. I enjoy what I do and the countless responsibilities that go with it. But in the past year, I began a new important job: being a dad. So, amid all the preparation and paperwork for the shoot, I was also preoccupied photo-shopping images of Kaveh’s favorite toys to print and decorate the walls of our living room for his one-year birthday party the next day—a first for me. As the afternoon went on, the house became more and more festive. 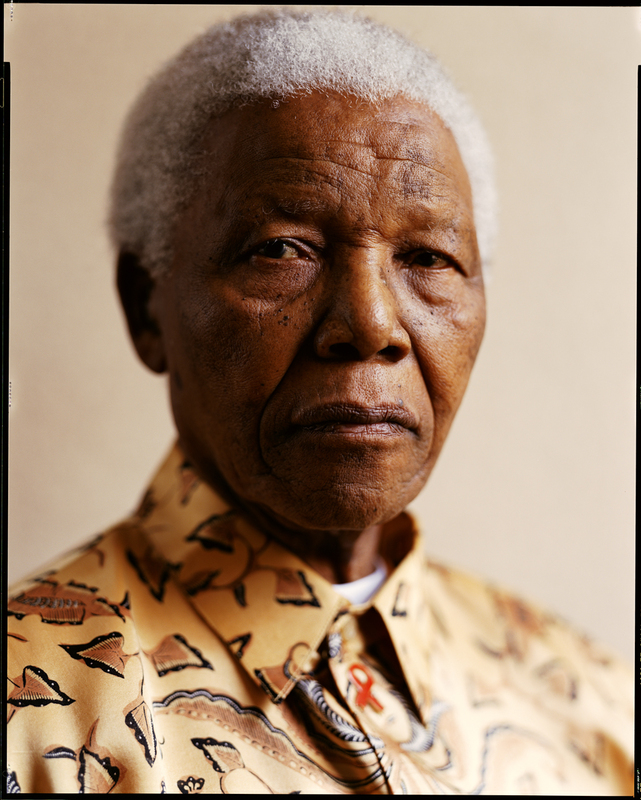 While I was hanging the last of the decorations, I took a moment to look up at a 30×40 photograph I’d printed a few years ago and hung in the living room – a portrait of Nelson Mandela that I created for the Black AIDS Institute. I thought of how my son played in this room so many times, learning how to walk and to say his first words, all with the face of this great man right above us. And now we were celebrating Kaveh’s first birthday here too. My mind drifted to the future, imagining how one day I will tell Kaveh the story of how Mandela changed the world, how he inspired me throughout my life, and what an incredible privilege it was to photograph him, to be in the presence of such a great man. I thought about the way I will share the story of how it happened – how I accepted a pro-bono assignment on a Friday afternoon and scrambled to get a two plane tickets for my assistant and me to get to Johannesburg as soon as possible. All this for a strictly scheduled five minute session with Mandela set for the following Monday. I still remember selecting the Deardorf 8×10 for the task. There is magic in that camera, its ability to capture every detail on a man’s face — every line, every scar, every life experience. This is what I wanted to put on film. I might spend the rest of my life looking at that image with my son. But to put into words what the whole experience meant to me– taking that trip, making that portrait, spending five minutes in a room with Nelson Mandela… I really don’t know if there are words for that. Everything was just about ready for the party. My wife and I were confirming the guest list when the phone rang with the news: Nelson Mandela had died. We both sat down, and neither of us said anything for what felt like hours. The party went ahead as planned the next day. There was singing and dancing, cupcakes and balloons. Friends and family gathered together with my wife and me in the living room and sang happy birthday to Kaveh, everyone full of smiles and laughter. I believe that Nelson Mandela was there too, watching over us all like a bright, shining light. Beautiful!!! Brings tears to my eyes! Full circle moment!